Ahhh....September. With the hopefully soon-to-be cooler temps, changing leaves, and sweater weather on the near horizon, I was having a craving for a tasty satisfying dish filled with fall flavors. 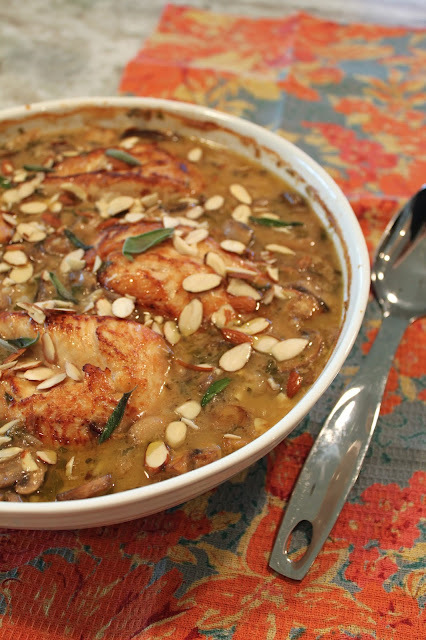 This delish chicken mushroom sage casserole fits the bill wonderfully. Fresh sage, parsley, mushrooms, and wild rice evoke memories of cool fall days filled with leaf piles, hikes, and an abundance of fresh air...ahhhh...can't wait! Inspired by a recent CSA box that came with fresh sage and parsley, this recipe was simply delish, not to mention super easy. If chicken's not your thing, you could easily exchange it for turkey, or even pheasant...according to T! I think he's trying to plant the seed now for when hunting season comes around! Serving Suggestions: hot swiss chard artichoke dip, steamed veggies, and crusty bread. Yum! Preheat oven to 375 degrees. Melt 2 Tbsp butter in a large skillet over medium high heat; add chicken and cook for 3 minutes or until browned; turn and cook 1 minute. Remove to a plate, and wipe down skillet. Chicken will be partially cooked. Melt 2 Tbsp butter in large skillet over medium high heat. Add shallots and sauté 3 minutes, or until translucent. Add garlic and sauté 30 seconds. Add mushrooms and cook 4-5 minutes, until softened. Stir in sherry, and cook 1 minute. Meanwhile, in a 3-qt saucepan over medium high heat, melt remaining 4 Tbsp butter. Whisk in flour, stirring constantly, 1 minute. Gradually whisk in broth. Bring to a boil, whisking constantly, and cook 2-3 minutes until slightly thickened. Remove from heat, add rice (save seasoning packet for another use), next five ingredients, and shallot mixture. Transfer to a baking dish and top with chicken. Bake at 375 degrees for 30-35 minutes, or until a the chicken's temperature reaches 165 degrees. Remove from oven and let stand for ten minutes. Sprinkle with sliced almonds and fresh sage before serving.